Why would we want to call a WCF Service asynchronously? 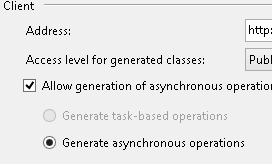 The biggest reason to move from synchronous to asynchronous is performance. When a synchronous call is made, the current thread locks till the call is completed. It varies by OS and programming language but most application will have a set number of threads they can pull out of a thread pool. If to many threads are being utilized to retrieve data synchronously it could cause the entire application to lock up while it waits for a thread to become available. This is bad when end user usability plays a large part in development decisions today. Asynchronous calls will call the WCF service and release the thread back into the thread pool. When the async call is completed a callback method is raised, this will pull out a new thread to consume the returning data. This entry was posted in C#, VB.NET, Web and tagged WebService. Bookmark the permalink.